We got our first snow for this winter one Saturday a couple of weeks ago. I put hay out for the horses in one of the shelters. But Francie wasn't having it. She preferred to play in the snow. Of course she dragged poor Phoenix with her. I suspect he'd rather stay in the shed and eat. It was just a few of inches. It kept us home for the day and Sunday we were back in business. My kind of snow. That was the perfect snow, it left quickly. I am ready for warm weather now. What a gorgeous picture! The horses stand out against the snow wonderfully. Francie is a miracle horse because YOU were her miracle. So now she lives such a joyful and curious life. Weekend snows are the best! You can relax, hunker down and just enjoy the beauty...and it doesn't interfere with commuting to work. 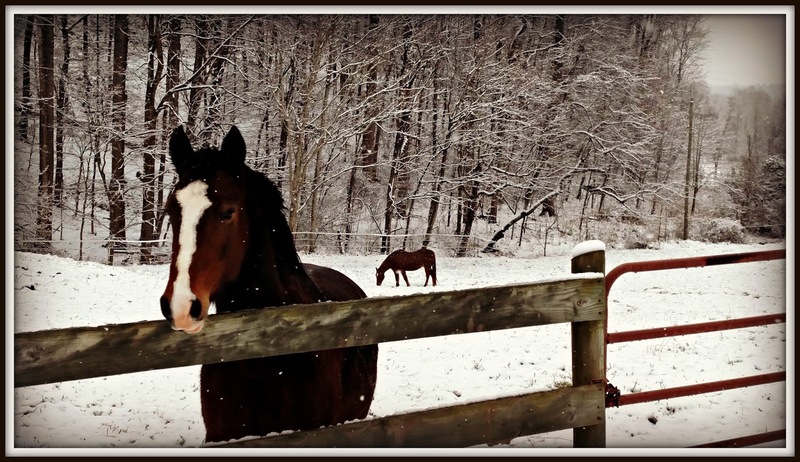 such a pretty photo of the horses in the snow! Looks like Virginia will get a lot of snow and cold weather. Right now we are getting single digits at night and not breaking freezing during the day. Snow in our forecast for Friday. I hope you all weather the storm ok. So beautiful,, and fresh, and cold! I'm going to have to side with Phoenix on this one. :) Here to wish you a happy new year! I LOVE that Francie was playing in the snow. Little Lewie was so excited about our first snowfall, too. Yesterday, we had a blizzard with arctic temperatures, so we had to stay indoors, but we sure are looking forward to a day of sledding very soon. A little snow is nice- we got a blizzard here yesterday and the temperature is below zero today. Boo. That is a bit too cold for me. I have to go and run a few errands but the thought of going outdoors has me bundled under blankets still. Such a beautiful photo, Lisa! I hope 2018 will be a very good year for you, and the guys. Before I moved to Idaho, I loved snow. Now, not so much. My dog, Hunter, is generally happy to be out there forever in it! Still bitterly cold here, but we have freezing rain today, and a promise from the weather people that it will warm up to the forties. Two weeks of this arctic air mass has about shut us down. My daughter told me some horses froze to death out in the pasture in Cincinnati. Hope yours are ok.
That's so cute! My Daisy cat loves being out in the snow. We had even less. Beautiful photo of the horses! I just love the photo! I adore horses and you are so lucky to have them..
Hi! I was just wondering, your bread machine cinnamon rolls/bread recipe, do you have a recipe for the cinnamon/sugar mix that goes inside? I would appreciate it! Thank you!! !